Is the Stock Market Getting Frothy? A look at the ongoing debate about current stock prices. Given that the Dow Jones Industrial Average (DJINDICES:^DJI) recently crossed the 15,000-point threshold for the first time in history, it should come as no surprise that there's an ongoing debate about whether stocks are headed for another bubble. But there's another side to this story. Enter Josh Brown, author of The Reformed Broker -- a blog I encourage readers to check out. In a post published at the end of last week comparing the stock market in 1999 to today, Josh makes a convincing argument that all of this concern is much ado about nothing. Here's a very rudimentary but essential thing to be aware of -- in 1999 the S&P 500 (SNPINDEX:^GSPC) finished at 1469, earned 53 bucks per share, and paid out $16 in dividends. These are nominal figures, not adjusted for inflation. The 2013 S&P 500 is earning double that amount -- over $100 per share. The index will also be paying out double the dividend this year, more than $30 per share, and returning even more cash with record-setting share repurchases. This sounds pretty good; what's the catch? What kind of premium, pray tell, are we paying for double the earnings and twice the dividend yield versus 1999's market? I'm so glad you asked -- turns out we're not paying any premium at all. We're paying a discount. 50% off. The current S&P 500 trades for a P/E of 14 versus 33 for 1999. So double the fundamentals for half the price. Josh then goes on to discuss the Case-Shiller cyclically adjusted P/E ratio, or CAPE. For those of you who aren't familiar with this metric, it's a 10-year rolling average of the S&P 500's P/E ratio. Its advantages are twofold. In the first case, it's the most widely available historical valuation metric you can find for the broader market -- do a search for the S&P 500's historical P/E ratio, and it's basically the only game in town. And in the second case, as its name suggests, by controlling for cyclical variations in valuation multiples, it makes for a nice, smooth line to include in charts. But, as Josh points out, there's a problem with relying on this metric to make contemporaneous investment decisions. That is, by including the last 10 years of valuations, the CAPE overstates the S&P 500's current multiple by nearly 38%. 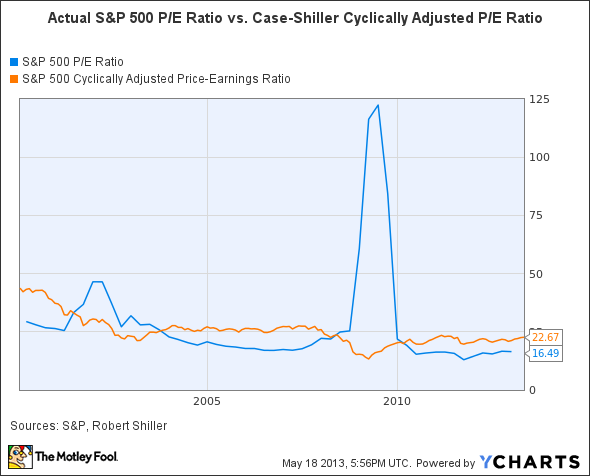 You can see this in the following chart, which compares the index's actual P/E ratio to the CAPE. Suffice it to say, the current gap is a function of the financial crisis, shortly after which corporate earnings were eviscerated and thus valuation multiples shot through the roof. This trend was particularly robust in the financial space, where large banks such as Bank of America (NYSE:BAC) and Citigroup (NYSE:C) were forced to record massive losses because of overexposure to subprime mortgages. I believe that the truth lies somewhere in the middle. Let's take a look at one last chart (the explanation follows). This is an index that compares the gross domestic product to corporate profits to the Dow -- all of which are adjusted for inflation. Over the long run, there's a strong correlation here -- if you work backwards from the Dow, this shouldn't be surprising. The overarching trend and magnitude of increase, in other words, is pretty closely aligned among the three variables. Yet at any one time in particular, there are discrepancies. The most notable of these were the 1960s -- the so-called "Go-Go Years" -- and the time period surrounding both the dot-com and housing bubbles. In each case, the performance of stocks outpaced GDP. And in each case, these intervals were concluded in dramatic fashion by stock market crashes. To get back to the present, if you look to the far right side of the chart you'll see that the Dow has once again eclipsed the GDP trend line -- it should be noted, moreover, that the extent of the eclipse is understated, since the data stops at the end of last year. If history is any guide, in turn, this is indeed indicative of an overheated market. On the other hand, to Josh's point, corporate profitability appears to be a primary impetus for the climb -- though, as you can see, this was similarly the case in the mid-'60s, late '90s, and early '00s. In addition, we obviously have a long way to go before the present resembles anything like those previous bubbles. My point here is this: Stocks are high. On a comparative basis, are they as high as they were during these earlier periods of excess? No. And could they go higher? Yes. Absolutely. In fact, I'm inclined to think they will in light of the Federal Reserve's ongoing liquidity measures. But these factors aside, it's important that investors have a decent idea of where we're at.